Dani Alves is a serial winner who has lifted more trophies than any other active player. For the release of a new film documenting Pep Guardiola's Barcelona tenure, he tells Sky Sports why he turned down a reunion with his old mentor - and how he almost ended up playing for Jose Mourinho. Dani Alves holds the thumb and index finger of his tattooed right hand no more than a centimetre apart. We are seated in a glitzy Paris hotel just off the Champs-Élysées, and the Brazilian, the most decorated active player in the game with a total of 39 trophies won, is recalling one of the biggest sliding-doors moments of his extraordinary career. "I didn't go to Chelsea because of the club, not because of me," he says. It was the summer of 2007, before Alves had joined Barcelona or even met Pep Guardiola. At the time, he had just finished his fifth season at Sevilla. He had won a UEFA Cup, Copa del Rey and Spanish Super Cup treble, the beginnings of the staggering success story to come, and Jose Mourinho's Chelsea beckoned. Or at least, that's what he thought. "I thought it was done, that I was going there to work with him," he continues. "I don't know if he got different information, that I didn't want to go or whatever, because since then our relationship hasn't been so good, but it wasn't my fault. I was convinced that I was going to work with him and form part of his team." Chelsea and Mourinho would come to regret it, their acrimonious split coming just a few months later, but for Alves it was a blessing. Within a year, he had signed for Guardiola's Barcelona, where he would take his career to historic heights, collecting silverware at a remarkable rate and becoming a thorn in the side of Mourinho and Real Madrid in the process. "It didn't turn out too badly for him, eh?" With that, Alves laughs, a huge, cartoon-like grin spreading across his face. The right-back, now 35, is at Paris Saint-Germain these days, recovering from the knee ligament injury he suffered last season, but for now the focus is back on those heady times at Barcelona. This month, he will appear in Take the Ball, Pass the Ball, a documentary about Guardiola's reign. Barcelona, of course, were historically good under Guardiola, perhaps the greatest club side of all time. In total, they won 14 trophies in four whirlwind years between 2008 and 2012, with the 2011 Champions League final, that mesmerising 3-1 win over Manchester United at Wembley described by Sir Alex Ferguson as "a hiding", the undoubted peak. Few players were more important to their success than Alves, who made more than half of his 391 appearances for the club in that period, but the architect of it all was the man in the dugout. The man for whom, in Take the Ball, Pass the Ball, Alves says he would have jumped off the top of the third tier of the Nou Camp. "Guardiola improved me a lot as a footballer, he taught me a lot of things and that's why in every interview I'm asked I always say the same thing: He is the best manager that I have worked with," he says. "He is a genius at key moments. He knows how to let his players know exactly what they should be doing. On many occasions, he was a manager who won us matches. We just had to follow his instructions." Guardiola was not the only genius at Barcelona, of course. 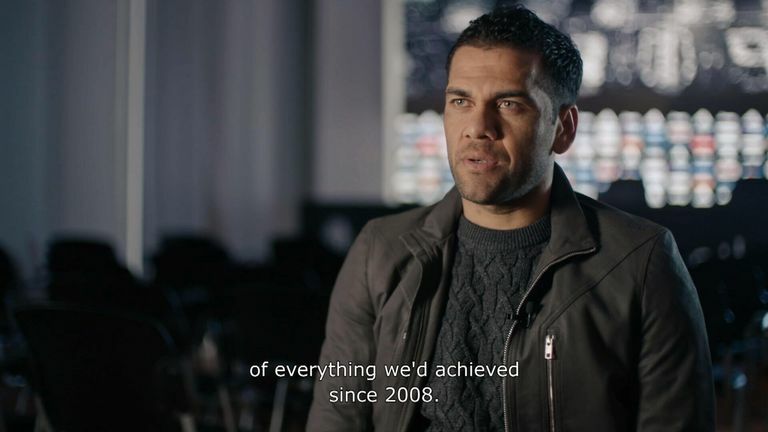 When asked how much he enjoyed having the freedom of the right flank in Guardiola's team, Alves, never one to miss an opportunity, spots a chance to steer our interview towards one of his very favourite topics of conversation. "I had a pretty good team-mate there," he says as his mischievous grin and bellowing laughter return, "a good team-mate who still looks promising." Alves' telepathic understanding with Lionel Messi was one of Barcelona's greatest weapons under Guardiola. He joined the club four years after the Argentine's debut and left it in 2016, but two-and-a-half years on he remains the player to have provided more assists for Messi than anyone else. It's an impressive feat - not least for a right-back. I felt as if I was playing in the street in front of my house in Brazil in a pair of flip flops. "I did all I could to serve him, to make sure he was happy and to make sure he had the ball all the time, which is what he loves most," explains Alves. "It's like a child when you give him his first present. You give him a football and he plays with it all day. I was in charge of making sure the ball was always at his feet." Alves is known for his eccentric character. Take a look at his Instagram page and you will find videos of him trying on his wife's stilettos, singing into a toothbrush and placing his pet cat on his head. But he did not achieve everything he has achieved by clowning around. There is also a steely intensity to him, a seriousness, and an obsession with the game which is never more apparent than when he talks about Messi. "It was very strange because from the time I arrived at Barcelona, from the first day, we had this very, very, very, very weird connection - I mean that in a positive way. I remember the first game we played together as if it was today. We were doing one-twos all the time, we understood each other with no more than a little look. We knew exactly where the other one was. "I started to think, 'Wow, I don't know if we're going to win something but at the very least we are going to enjoy ourselves'. That was how I understood football. Football is a sport to go and enjoy, to go and have a good time with your friends. I felt as if I was playing in the street in front of my house in Brazil in a pair of flip flops. "It was surprising for me because I came from Sevilla, from a totally different style of football to Barcelona. In that moment, that connection with Leo, it was like setting off fireworks. I said to myself, 'Wow, I'm going to play here for a club which defends what the word football really means'." Alves loved his time under Guardiola at Barcelona, which begs the question, why did he reject the chance to be reunited with the 47-year-old at Manchester City when he left Juventus in 2017? How did he end up here, in Paris, instead? It was a shame not to work with Guardiola again because he knows I adore him, but at the same time it was a new challenge which is what changed my mind. "It was all done to go to Manchester City but it didn't happen because of a family decision," he says. "Pep knew my intentions. I spoke with him, he knew my intention to work with him and his staff again. He knows the gigantic respect I have for them, which is why I wanted to work with him again until something else came up. "In life you have to weigh everything up, even when they are just decisions about your career. I like my decisions to be taken carefully, so they don't harm anyone close to me, so that the people close to me are happy. "I know that if the people close to me are happy, I am happy, and I can do my job better. For me, it was a shame not to work with Guardiola again because he knows I adore him, but at the same time it was a new challenge which is what changed my mind." 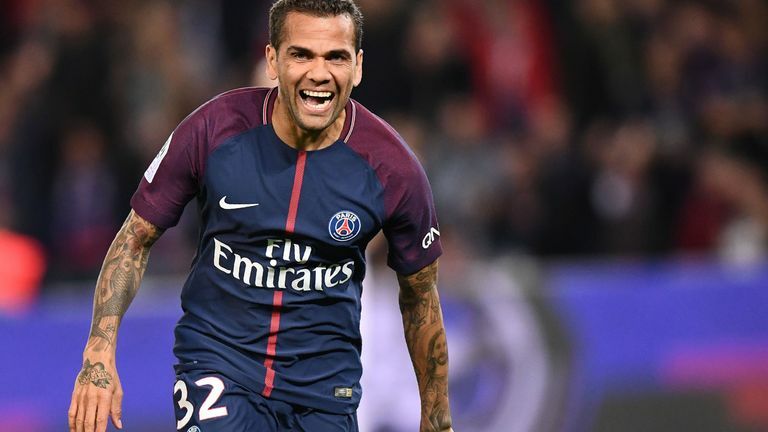 Alves has enjoyed yet more success at PSG, adding another five trophies to his haul, but does he regret not having played in England? There is a twinkle in his eye as he considers his answer. "No, no I don't regret it… and anyway my career is not over yet," he grins. "English football is a type of football which excites me a lot." Alves will be preoccupied by PSG's game against Monaco when Guardiola and Mourinho lock horns again in the Manchester derby on Sunday, but the fixture is a reminder, nonetheless, of all that went on back in Spain. On Wednesday night in Turin, Mourinho even warmed up for the occasion with an antagonistic celebration which harked back to the old days. So can Guardiola and his Manchester City players shut out the noise just as Alves and his old Barcelona team-mates managed at Barcelona? "We didn't think much about Mourinho," he says. "We thought about how we were going to do things, how we were going to execute what Pep wanted, how we were going to play against the top rivals we faced along the way, and what we were going to do to overcome them. "That was one of the most unusual things about Barcelona. Barcelona focus a lot on what Barcelona does, and not on what others are going to do. It creates a different way of working. Of course we studied our opponents to see their weak points and their strong points, but 70 per cent of the time it was about us. "I think it worked to perfection. When you focus on what you are going to do, it's difficult for you to fail because it's a lot of execution, a lot of training, a lot of practising, practising, practising. So when it comes to the games, it is just about replicating what you have done through the week or the month. It makes things very, very easy." The truth, of course, is that nothing about Alves' success should be written off as easy. It is a story of enjoyment but it has been driven by relentless hard work and determination. In another life, he might be lining up for Manchester City on Sunday. He might even have ended up with Mourinho as his mentor. But why would the world's most decorated footballer hold any regrets? And besides, Dani Alves is not done yet.